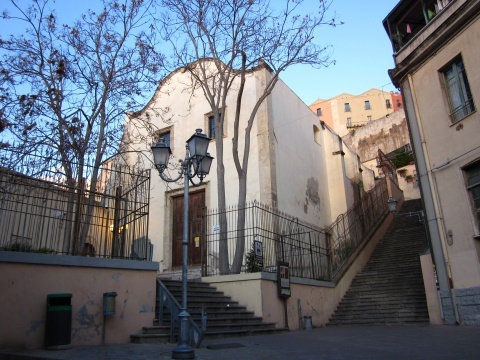 The church is located over Santa Chiara's hill, close to Piazza Yenne. Originally dedicated to St. Margaret, as attested by the architectural structure and the inscription "S. MARGARET V.M. 1690 "placed outside, on the lintel of the lateral door, it was founded together with the Convent of the Nuns of St. Clare, which was built at the beginning of fourteenth century in the western slopes of Castello's hill to accommodate the Poor Clare Nuns who remained there until the nineteenth century. The building presents a decorative baroque style in the pilasters that surround the chapels ,on the capitals and in the frieze above. During the bombings in 1943, the structures of the monastery were damaged so much that it was shot down. Some ruins are still visible from the point where it was recently placed an elevator that leads to Castello district. However, a great part of the area was re-used in 1957, for the opening of the local market which still exists.